Stock - Issued by Nuclear Research Associates, Inc. - November 22, 1966. 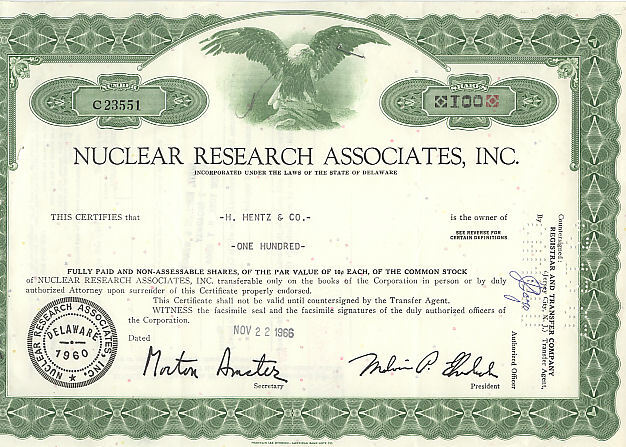 (1898) Stock - Issued by Nuclear Research Associates, Inc. - November 22, 1966. - Condition: Very Good This beautiful stock has a majestic eagle vignette with a decorative border. It was printed by the American Bank Note Company and bears the printed signatures of the Secretary and President of the Research Associates. A beautiful historical document. The stock was issued to H. Hentz & Co. Stock measures 11 3/4" by 7 3/4". Price: $18.00 + shipping.